The Crested Auklet is a stocky seabird with conspicuous crest of curling forwards feathers on the forecrown. Both sexes have this ornament and usually choose mates with large crests. They have a distinctive citrus-like odor to their plumage. This scent is produced by some tiny wick feathers located in the shoulder area and is used first to repel ticks. This scent is also used in social behaviour between members of a group, and between mates during the display called “alloanointing”. The Crested Auklet is highly social and forms large breeding colonies including several other auklet species. The adult has dark plumage overall, with dark sooty grey upperparts, wings and tail, and brownish grey underparts. The head is dark grey too. We can see a distinctive blackish curling forwards crest above the bill, and some white auricular plumes across the ear-coverts. The bill is bright reddish-orange with yellow tip. The eyes are white. Legs and webbed feet are bluish-grey with darker webs and black claws. Both sexes have similar plumage but the female may have slightly smaller bill and less recurved shorter crest. The juvenile resembles adult in winter, but it lacks the crest and the white auricular plumes. The smaller bill is dull brownish-yellow. The eyes are grey. During winter, the adult’s bill becomes smaller while losing the different horny plates at the end of the breeding season, especially after the incubation. The bill is duller in colour and slightly smaller. The crest and the auricular white plumes are usually reduced. The Crested Auklet occurs in NW Pacific Ocean, especially on remote islands and coastal areas in the Bering Sea and North Pacific. It is also found on the Chukotski Peninsula in E Siberia, Kurile Islands and other islands in the Okhotsk Sea. It winters at sea along the coasts in the Bering Sea, and often remains near its breeding areas where it can find ice-free waters S to Gulf of Alaska and N Japan. The Crested Auklet breeds on remote islands or coasts. They form large colonies established along rocky cliffs, on talus slopes, boulder fields and lava flows, with sometimes scattered vegetation such as mosses and grasses. It forages in deep water and usually far offshore, where it can find dense aggregations of zooplankton. It is usually seen in large flocks in winter. 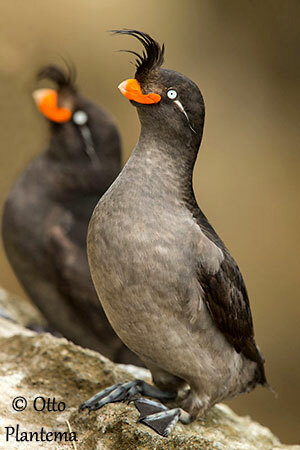 The Crested Auklet is very vocal during the breeding season and when in flocks at sea. They produce barking, trumpeting, cackling, hooting and whining sounds. They are vocal by day when they are most active. Each sound is associated with behaviour, from contact to courtship or sexual advertisement. The chicks produce soft peeps and loud warble-whistles. 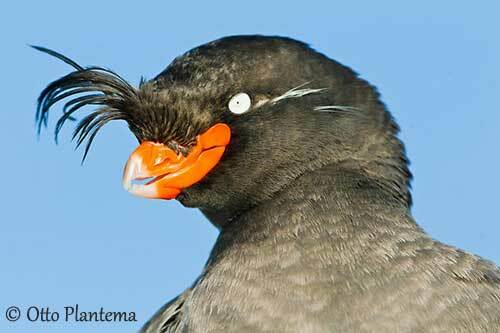 The Crested Auklet feeds on crustaceans, fish, squid and various marine invertebrates. The chick is fed with planktonic crustaceans and other invertebrates. Both parents carry the food in their sublingual throat pouch. During summer, it forages at 5-50 kilometres away from the colony, and dives at depths to 30 metres. They are strong swimmers. They feed in social groups, diving and foraging underwater on the ocean floor. The bird pursues the prey underwater, propelling itself with the wings, like during a rapid flight. 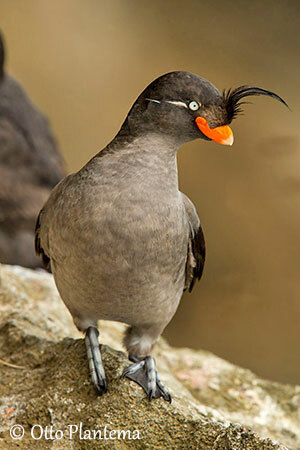 The Crested Auklets are monogamous and faithful to mate and breeding site. However, mates do not maintain the pair-bonds at sea, but they meet every year and reform the bond at the nesting site. They are colonial breeders. Within the colony, the more dominant bird has typically longer crest than other auklets. The courtship behaviour allows pair formation and includes stereotyped postural displays increasing in intensity as the pair formation progresses. Both mates engage in alloanointing. They intertwine their necks to distribute the citrus-like scent in their feathers. Then, the male guards the female from other males, and follows her around. The displays are accompanied by vocalizations such as trumpeting by the displaying male, mutual cackling sounds during intense billing between mates. When both birds begin neck-twisting, the courtship is almost at the end and the copulation occurs, usually at sea. This species usually remains within ice-free waters near the breeding range during winter. Some movements SW to Japan and SE into Gulf of Alaska are reported. They gather in large flocks at rich food sources at offshore locations. 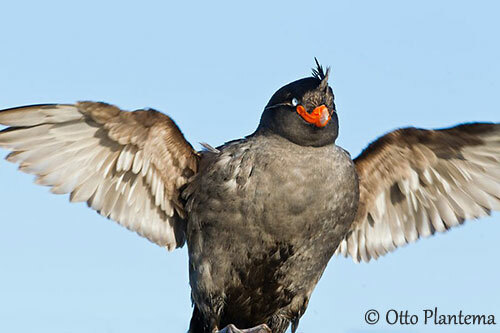 The Crested Auklet has long wings allowing fast, direct flight. It is a powerful flier, and when several birds take off together, we can hear a loud sound produced by the wings. 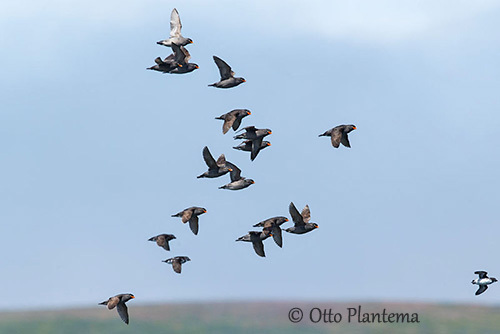 They fly in flocks between the nesting sites and their marine foraging areas. In addition, the Crested Auklet moves quickly and easily on land, and it has an upright stance. It also climbs rocks, using its sharp claws and fluttering the wings to maintain the balance. The breeding season occurs between May and mid-June, according to the snow melt. The Crested Auklet breeds in large colonies, some of them larger than 100,000 pairs. Densities depend on suitable nest-sites such as rock crevices and cavities, and are highest on bare scree. It does not add nest materials. The female lays a single white egg, becoming stained in the cavity. Both sexes share the incubation equally during 34-35 days, and both parents spend the night together at nest. At hatching, the downy chick is continuously brooded during the first week, and one of the parents remains with the chick for the first ten nights. Once the chick is able to thermoregulate itself, the parents leave the nest together for foraging. The Crested Auklet can store the food in its sublingual pouch. At nest, the chick is fed 1-4 times per day. The nest is kept clean. The young depends on parents for one to three months. It fledges when it has almost the adult mass. It leaves the nest several following nights to stretch its muscles for the flight. When ready, it takes off from a boulder to reach the sea where predation is heavy. The young often departs at night to reduce the risk of predation. 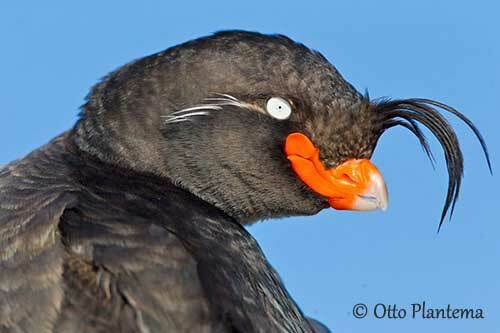 The Crested Auklet is preyed upon by avian and mammalian predators, but also by large fish. The predators attack the auklets on land, at sea and in the air, and wait near the nest entrance. Mammals enter nest crevices and take chicks and eggs. 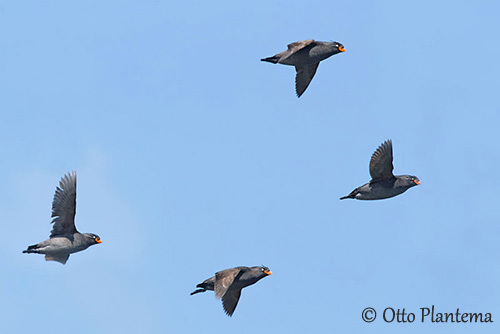 To avoid predation, the Crested Auklets take flight in flocks, circle, weave back and forth or fly directly into their nests. They often try to find safety in numbers. If caught by a predator, the bird becomes very aggressive and performs bill-pecking, scratching and wing-beating, and many of them can escape. The global population is estimated at about 8,200 000 individuals, but is suspected to decline due to predation by invasive species (foxes and rats), human disturbance and pollution. 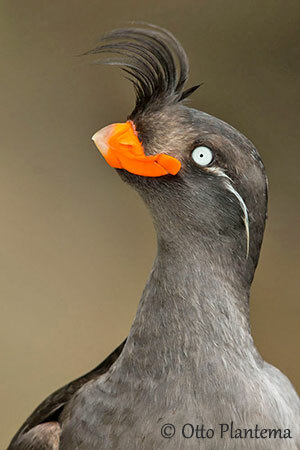 But currently, the Crested Auklet is evaluated as least Concern.